I have always had a strong relationship with my breakfast. Growing up my mother served us a proper Indian breakfast with idlis, dosas, paniyaram, upma (which btw I never approved of), avalakki or poha and parathas on the menu. Breakfast was always and still is an elaborate affair in my parental home. When I got married, my husband and I got into eating fruits, dry fruits and a glass of vegetable juice with a very heavy lunch and a moderate dinner thrown in every day. This continued for years until I was expecting and couldnt eat practically anything in the first trimester. Then I slowly starting eating some whole grain cereals to begin the day with. The whole process of child birth and nursing left me craving for big meals in the mornings and I found myself going back to proper breakfasts after “the arrival” which rocked my world in many ways! It’s been a year since Hari started playschool and tomorrow is the last day of this academic year. Him starting school changed my life in many ways. We both got used to living without each other for a few hours each day (psst…I’m still getting used to it!) apart from many other changed that shook our world! And yes it also changed my equation with breakfast once again! I got used to making breakfast early in the morning to put in his snack box, which almost always came back untouched. This continued for two months until idlis came into my life again and then began my special relationship with them. The first time his snack box returned home empty, I had packed baby idlis with chutney! And now he has progressed to other foods, but the day on which there is baby idli, I know for sure that he will always return with the great eater sticker on his tee! Growing up, I always preferred to have idlis with sambar and chutney, breaking idli into small pieces and dunking it into a bowl of sambar and scooping it up with a little chutney. But now plain idli with chutney is what I make on most days reserving the sambar for special occasions or for those days we are in a mood for something more elaborate. There are many recipes for idlis with different ratios and proportions of rice and urad dal but this recipe which I’m sharing with you today works the best for me and gives soft and fluffy idlis with the perfect texture. In Tamil Nadu, rice which is ground fine is used and in Karnataka idli rava made from rice is used to make this popular breakfast item. Many mothers down south swear by stocking up idli batter as a life saver. You can do so many things with it, stir in some semolina into left over idli batter and make utthappam or even make paniyaram with it. So much variety and so healthy! You know what I loved most as a school girl even more than the actual idli? The idli fry that she made by shallow frying the mornings idlis with vegetable oil and sprinkling it with spicy chutney powder. You can take a girl out of her mother’s house but you can never take away the memories connected with her. I prefer using idli rava, which is easily available in most grocery and departmental stores. 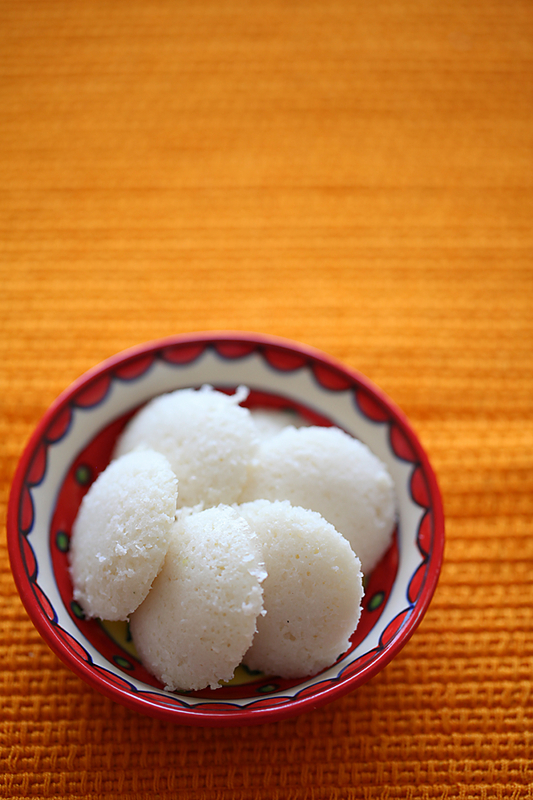 You can also use boiled rice also known as idli rice instead of idli rava to make idlis. 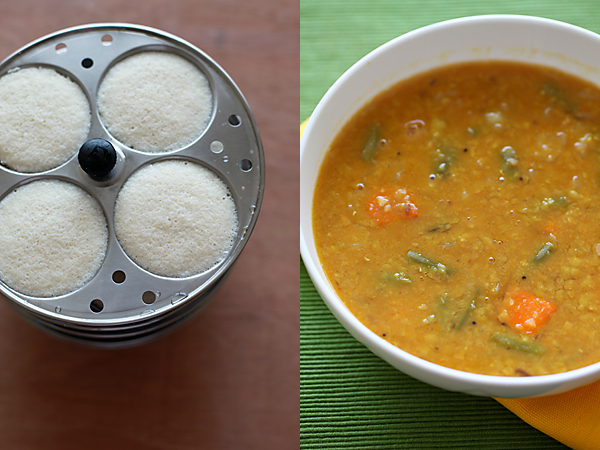 Wash and soak the idli rava and urad dal separately for 4 to 6 hours or overnight. * Drain and grind urad dal with 80 ml (1/3 cup) to water. In a large utensil mix the ground urad dal with the idli rava. Pour approximately 125 to 185 ml ( 1/2 cup to 3/4 cup) water (you might require a little less, depending on the quality of your urad dal) into the batter to get a soft cake like batter, add the salt, mix well and allow to ferment for 12 to 16 hours. Lightly grease the idli moulds with cooking oil. Put in some water into the idli cooker with the water level inside the idli cooker below the level of the last idli mould plate (so that the idlis don’t get immersed in water). 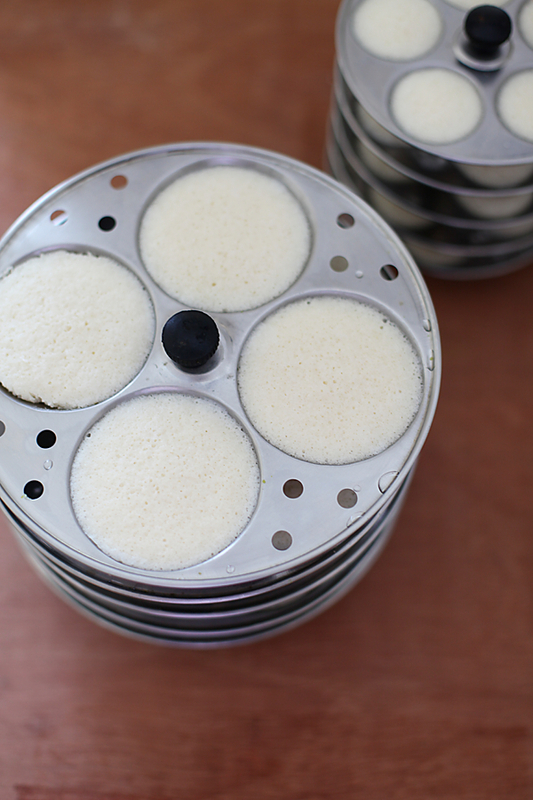 Pour the fermented idli batter inside the idli moulds leaving a little place for them to rise. Place the idli cooker with the water on medium heat and when the water begins to boil, put in the idli stand, cover and steam for exactly 10 minutes. After you turn off the heat, let the idlis rest in their moulds for about 10 to 15 minutes. Then, gently unmould the idlis with the help of a spoon and serve hot with chutney and sambar. * You can also use boiled rice or idli rice instead of idli rava. 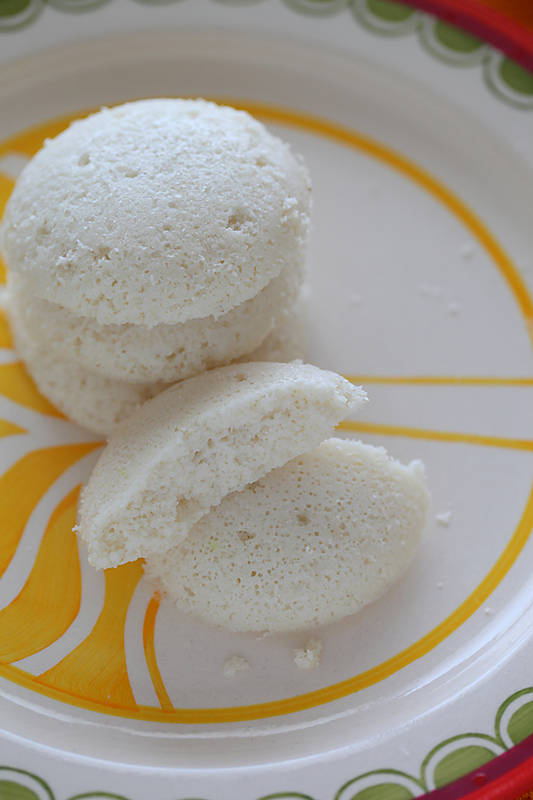 This recipe makes super soft idlis. For regular soft idlis use 60 gm (1/3 cup) extra rava. * The water used depends on the quality of the dal but is more or less the same. * If you plan to make idlis for breakfast, then soak the ingredients around noon and grind the batter in the evening around 5 pm and if you plan to make the idlis for dinner then soak the ingredients overnight and grind early in the morning. * Do not wash the rice rava or dal too many times before grinding. *Add the salt when mixing the ground urad dal with the rice rava or rice. Don’t overmix the batter once it is fermented. Give it a light stir or mix before pouring into the moulds. * If the temperature is cold then the batter takes upto 24 hours to ferment. * In case of a cold climate or if you live on foreign soil, pre heat the oven at 200C for about 10 minutes, turn off the heat and place the idli batter (loosely covered with a cloth) inside the oven with the light inside the oven switched on. You can also leave the batter covered with a thick cloth in a room with an electric heater. *If using parboiled rice instead of idli rava use 3 cups rice for one cup of urad dal. *The proportions given above are made using cups measuring 1 cup=250 ml. This is a simple and delicious chutney which goes well with all south indian breakfast dishes. In a blender put in all the ingredients for the chutney and blend into a smooth mixture. You can keep the consistency a little coarse and it need not be as smooth as it would be for curries. In a small wok, heat the oil and put in the mustard seeds. When they pop, add the chilies, curry leaves and asafetida and turn off the heat. 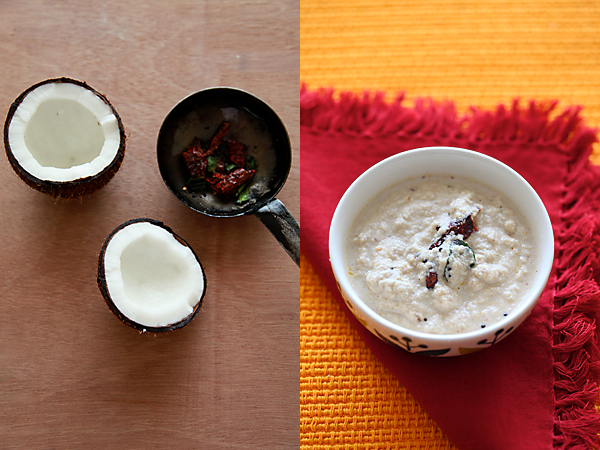 Pour the hot seasoning over the ground chutney, mix well and serve with idlis or dosas. Wash and soak the toor dal for fifteen to thirty minutes. Pressure cook the dal with 3 cups of water and turmeric until done, about 3 to 4 whistles depending on your pressure cooker and the quality of your dal (organic dal takes longer to cook). Alternately use a saucepan if you don’t have a pressure cooker. Once the pressure drops, put in the chopped vegetables and pressure cook again till done, about 1 whistle. After the pressure drops, remove the whistle and keep aside. Mash the tamarind with your hands, releasing the pulp into the water and keep aside. In a wok or a saucepan, heat the oil over a medium flame and put in the mustard seeds. When they pop, lower the heat and add the fenugreek and the curry leaves along with the asafetida. This has to be done in quick succession before the fenugreek turns dark brown or black (if this happens the dal will turn bitter!). Add the remaining 1 1/2 cups of water into the pot. Pour the tamarind water into a strainer held over the seasoning pot and bring to a boil. Stir in the sambar powder and boil again. Pour the seasoned tamarind mixture into the dal with the vegetables and bring to a boil again. Stir in the salt and adjust the consistency of the sambar by adding more water if required and serve hot with the idlis or with rice. * My sambar powder is quite potent and 1 tbsp is enough for this recipe but I have found myself adding 2 tbsp of sambar powder depending on the strength of the powder. The amount of powder added depends on its strength, so judge and add accordingly. My batter is rising perfectly as we speak. Life is so much easier for idlis in summer :). My kids, now teenagers love idlis. While I love the roasted idli, kids don't care for it :(. Oh my GAWWDDD this has once again transported me back home to Amma's 🙂 Its so true what you say about taking a girl out of her mother's home, but you can never take the kitchen memories away from her 🙂 Must try your ratio of idli hittu soon, those fluffy, porous idlies look to die for! I loved idli fry as a kid too! Still do, in fact:-) But I was introduced to them by my my father, who made them for me as an after school snack one afternoon. I've been hooked ever since! Thanks for this lovely post; it brought back so many cherished memories! All I can say is Thanks!! I was looking fwd to breakfast recipes….Pls upload lots and lots of them. 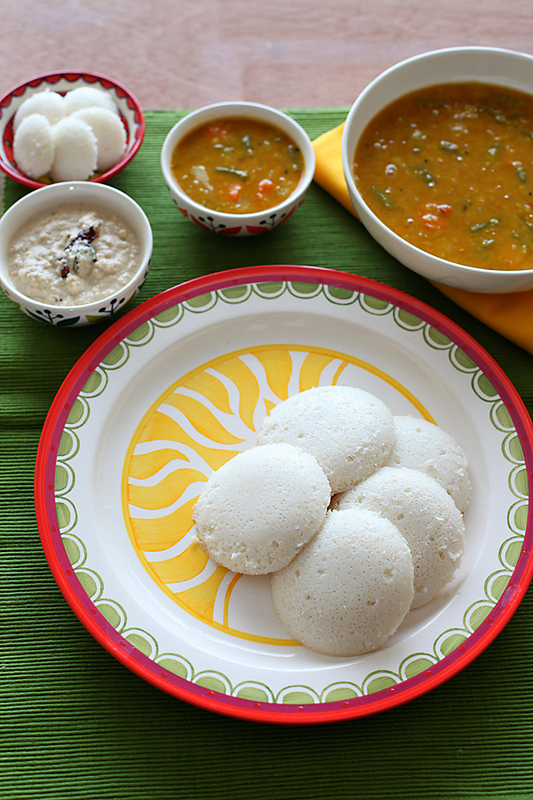 My3: Yes…it is much easier to make idlis in summer! chinmayie: You are so right! Revati: Hope you like this recipe if you happen to try it! Vatsala: You are most welcome! And you are lucky to have such lovely memories with your father. Shruti: You are welcome Shruti..will definitely post more breakfast recipes. WOW!! What pictures Anu… Idlis look so soft, fluffy and tempting! Having grown up eating idlis all my life, as any other south Indian, I must say it is one of the most healthiest and easily digestible breakfasts! Thanks for sharing this recipe with the world! In case i use idli rice or boiled rice, will that quantity also be 1 1/2 cups?? Gorgeous pictures! 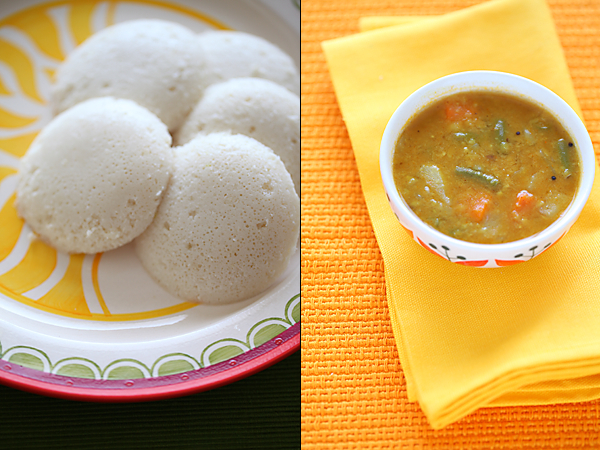 I make idlis exactly the way you do, with the exact same proportions and soaking time. The only difference is I don't soak idli rava but just add it directly to the ground udad dal and allow to ferment. My idlis NEVER come out well, and I've stopped making them altogether. I live in Hyderabad, so fermenting is not an issue. Can you tell me what I must be doing wrong? Someone once told me my batter was too thick, and so I tried adding a little water to make it smoother but the result was sticky idlis. I would really appreciate some help from you. Ashwini: You are most welcome. Thanks as always for your consistent and regular feedback. Preeti: If you are using parboiled rice use 3 cups for every cup of dal. Sudha: It actually depends on where you live and how cold it is. In any case the oven is switched off. One will have to experiment a little if living in extreme climatic conditions to get the right batter. My recipe for idli is ditto like yours. Love the way you've presented Idlis in the first picture. A brilliant and healthy South India dish well presented. So glad I discovered your beautiful and interesting site! There is so much about your cuisine I wish to learn, starting with the names! Love this beautiful dish, so refined and so complex flavors. Nice to know that Hari started school!…love kutti idlis are so cute..love the entire spread.. Your sambar sounds delicious! So does everything else in this post. Thanks so much for this. Have been making Sambar from a recipe book I bought here in the UK but it just wasn't right. This one looks so much better! Anjali: Thanks for the feedback. The colour could be largely due to the variety of the ingredients used. Can one use basmati rice instead of parboiled rice? sirusace: You can use basmati if you dont have access to any other quality of rice. Use 1/2 cup more than you would for parboiled rice. If im using boiled rice instead of rava, will the quantity of water change? Hey, I just wanted to say that your description is very precise and very detailed. By this, I can tell you are very organized person. I have always had trouble with idlis. After reading your recipe, I am starting to feel confident and I am going to try again. Thank you. Bhavana: No..it will be more or less the same. Rati: You are really sweet! Thanks for your appreciation. I finally got down to doing this your way and the results were fabulous, Anushruti! Perfectly fluffy idlis with just the right sponginess. Im glad i chose today to go the whole 9 yrds and make sambar as well as chutney because it made for a very satisfying, wholesome and filling dinner! Took me back to my moms kitchen! I have been resorting to MTR ready mixes simplefor the convenience because i used to fid it hard tk make batter for just two people. But this was just right. Gave me enough idlis for dinner and a little extra batter for a few more for breakfast tomorrow. Thanks for sharing this! Secondly, did u grind using a mixer or grinder?? Revati: That's really nice to know. PG: 3 cups parboiled rice for 1 cup urad dal. My elder son now 7 years oldis crazy abt southindian food esp idli with sambhar chutney…..he can ve it three times a day……and my younger one has also started liking it..
Priya- Great to know that! I am in middle of making coconut chutney but I am stucked as I don't know how to roast Chana dal. Plz. Reply urgently as my child has to take it for breakfast tomorrow morning. Sapna- The roasted channa dal used for chutneys is readily available in the market as dalia or phutana. Tried these. Came out really well. A special request – Please give the recipe for wholewheat no-knead bread loaf. I have heard that it comes out lighter than regular wheat bread. Idlis came out really good. Couldyou please give recipe of noknead wheat bread loaf as it is lighter than regular wheat one. Mina: Thanks for the request. Will try and put it up!